(Bloomberg) -- Some may question the strength of the stock rally and fear volatility, but signs of economic stability in China favor the sector most exposed to that nation: miners. Strategists at Credit Suisse just upgraded the industry to overweight and make points worth hearing. China is key and accounts for about half of global copper demand, and more than 60 percent of iron ore consumption. Historically, mining stocks outperform one to three months after Chinese purchasing managers’ index data turns, according to Credit Suisse. And yes, China’s manufacturing activity picked up and returned to positive territory last month, amid strong domestic demand, falling inventories and stabilizing monetary policy. The country has also started to implement stimulus to support the economy, and the effects might materialize in the very near future. 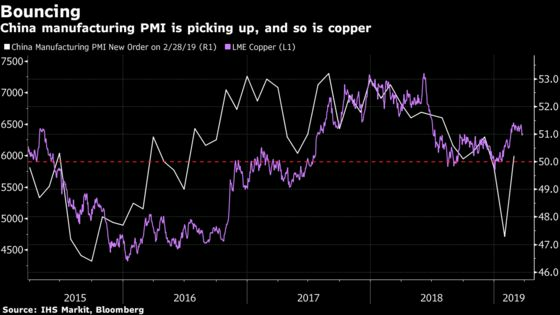 In fact, copper prices are already bouncing. But that’s not all. Monetary policy could also play a part. The dovish Fed is weighing on the dollar, which is supportive of commodity prices. In addition, Credit Suisse found out that miners are one of the best-performing sectors following a yield curve inversion, and beat the market 80 percent of the time when that happens. 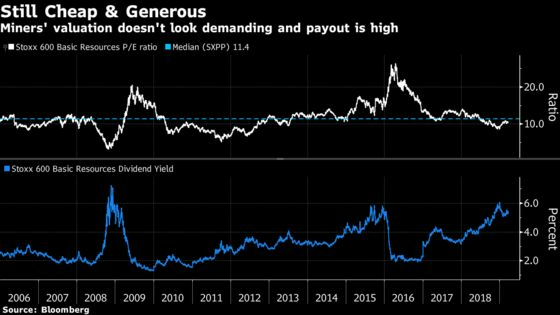 Valuation-wise, the sector doesn’t look pricey, hovering just above a 10 times price-to-earnings ratio, and offering one of the best dividend yields in the market. Miners have cleaned up their balance sheets to become one of the least-leveraged sectors in Europe and have focused on shareholders’ returns. So what could spoil the party? The obvious thing would be a negative switch in macro data, triggering a slump in metal demand and commodities prices. Some weakness can’t be ruled out, especially if you look at technicals, as the SXPP seems to have formed a double top. 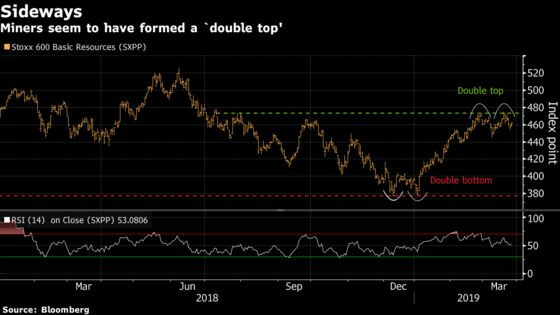 It’s also worth keeping an eye on the pound’s strength, as most miners are U.K.-listed, and Brexit news seen as positive by the market could limit the upside for large caps. Still, further voices came out this week to support the miners. Morgan Stanley believes the sector is still attractive, citing reasonable absolute and relative valuation levels, low leverage and metal spot prices supporting earnings-per-share upgrades. In term of single names, they prefer Anglo American, Glencore, Lundin Mining and Norsk Hydro, while Credit Suisse has Norsk Hydro and Glencore as their only overweight plays. Ahead of speeches from ECB President Mario Draghi and other central bank representatives, Euro Stoxx 50 futures are trading up 0.4%. Watch European autos after a report that Renault is seeking to restart merger talks with Nissan as a first step towards eventually making a joint offer for Fiat Chrysler. Watch Volkswagen, BMW, Daimler and Peugeot for reaction to the news. Watch European Boeing suppliers after a 737 Max aircraft, which did not have any passengers on board, had to make an emergency landing in Florida on Tuesday due to engine trouble. Watch Safran, Senior, Rolls-Royce, Leonardo, Meggitt, Melrose Industries, Thales and BAE Systems. Watch oil and oil companies as crude is on course for its best quarterly gain since 2009, with the latest jump coming after Russian Energy Minister Alexander Novak told reporters that the country will likely reach its pledged output cut of 228,000 barrels a day by the end of the month. All eyes will be on weekly U.S. inventory data this afternoon. Watch the pound and U.K. stocks as the House of Commons will attempt to break the deadlock on Wednesday with votes on alternatives to Prime Minister Theresa May’s divorce deal with the European Union. One positive for May is her deal is slowly getting more support from hardliners. More details of how this is going to play on this handy graphic. Watch the lira and Turkish stocks after Turkey has made it virtually impossible for foreign investors to sell the lira, averting a currency slide that might have dealt a blow to President Recep Tayyip Erdogan before local elections this weekend. Lawmaker Wants Intelsat to Share Airwaves Sale Payout With U.S.
Citi raised Pets at Home to buy, saying the company now has a “viable plan” for a business turnaround, helped by market dynamics and company initiatives after the veterinary strategy update. Citi said those positives could drive Ebit growth, estimated at +14% CAGR FY18-21. Price target is 180p. Citi says investors may be getting ahead of themselves by sending Wirecard’s stock 26% higher on Tuesday after the company said irregularities in Singapore have no material financial impact. Broker reiterates its sell rating as “significant uncertainties still remain,” including the ongoing Singaporean police investigations, which seem to have widened to include Wirecard subsidiaries in other countries such as India. Jefferies believes a lack of margin progress at Inditex poses concerns, even if total shareholder returns have been given a boost, downgrading the shares to hold from buy and cutting its PT to EU27 from EU32.